Mother Nature threw us a curve-ball in our last litter, leaving one puppy with an improperly-formed/under-functioning liver. Although hepatic shunts are most often associated with toy breeds or larger breed dogs with known inheritance of this condition, such as Irish Wolfhounds, this hepatic malformation issue can happen in any breed or mixed breed puppy. Our Mandy is one of these such puppies. She was discovered to be a poor-doer earlier this year and when returned to us in March, extensive diagnostics revealed a hepatic shunt. With an appropriate diet change to a hepatic-friendly prescription food and some liver supplements, she is now putting on some additional weight and in great spirits! Not knowing if or to what extent she would show response to medical management of her condition, we had plans of Mandy living out her life in our home and as part of our pack. Now that she's put on good fleshing and shown us no symptoms of encephalopathy, we are open to considering placement of Mandy in the right home. Because Mandy's been an eager learner since arrival to our home (she successfully graduated her AKC S.T.A.R. Puppy class last month and is currently working to pass her AKC Canine Good Citizen test), we would love to find a home that would like to continue casual training classes and possibly even consider competing with her in obedience, Rally, nose work, Barn Hunt or the like. It should be noted that despite her dramatic improvement, Mandy's expected lifespan will be shortened due to her condition; we hope she will have another 4+ years, but this is just our best approximation given her age, size and symptom resolution on her current course of medical management therapy. Mandy will also not be a candidate for spay surgery due to her inability to tolerate sedatives and anesthesia agents properly; to date, she has not experienced an estrus cycle, and we do not yet know if her condition will prohibit her from cycling regularly or at all. 8/28/18 Update: Mandy is doing wonderfully with medical management of her condition. She is on a supplement, an inexpensive medication and prescription food to maintain her; this therapy has her back to being a bouncy, happy young gal! 12/31/18 Update: Mandy is in a trial home with one of our previous puppy families. We are so thankful to Becky and her RR, Aoife, for taking in Mandy as part of their family. So far, things are going well, and we have our fingers crossed she thrives in her new home as well as she did in ours. Occasionally we keep back a puppy that just doesn't fit in with our current breeding plans or is not able to add what we are looking for to our breeding program; this decision is typically made between 18 and 36 months of age. Below are individuals that stood out to us as puppies, however, in the end just don't make the cut to become part of our breeding program. These adults are outstanding companions nonetheless and typically have had extensive socialization and training. If you are interested in more information about any available adult listed below, please contact us. Aoife now resides with her new mommy, Becky in MI. looking for placement at this time. 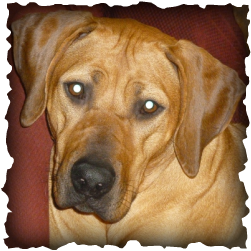 one of the Rhodesian Ridgeback rescue groups listed on our Links page.